"No man is an Island, entire of itself; every man is a piece of the Continent, a part of the main …"
Communications can be and is a powerful format. The types of communication in the 20th, and the beginning of the 21st century have included: semaphores, telegraph, carrier pigeon, American Sign Language (ASL), telephone, teletype, satellite, computers and the internet. It can be all encompassing, whereby everyone is fully informed; or it can be spotty, when important information is omitted or not distributed at all. Communications, an important part of Public Relations, is equally important as part of keeping Grange members informed of time-sensitive news. We’ll get to Grange communications in a moment. Communications can be quantitative and qualitative. It is both, but is not an equal equation. When I’m preparing a press release, I try to boil it down to less quantity, more quality. I try to put out a document or a memo which describes all the important bullet points while stringing together a beginning, a body, and an ending. Other forms of communications available to me are the telephone, e-mail and social media. I keep an updated contact list of phone and e-mail addresses and distribution lists in the event I need to send out important information to the Media Outlets, State Grange, Pomona, or my own Community Grange. This way I’m able to send, reply or forward information based on its importance or purpose in a timely manner. I mentioned briefly about Grange communications. In this case, it’s not only the ways we communicate; but I’m also referring to each Grange member with a telephone, or cell phone, and/or a connection to the internet being the important links. Each Pomona puts out Program Books with not only programs and dates, but also includes important phone numbers and addresses. These range from our CT State Grange offices and Officers down to our Community Granges and their respective members. The delegates, Deputies and State Officers at each State Grange exchange Program Books. 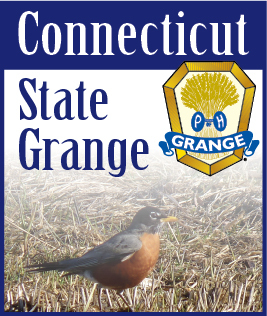 The CT State Grange also distributes a state directory for State Grange and all the Community Granges. Furthermore, these list the contact persons, who may best pass information along. Communications is the point I’m trying to make. We all have a responsibility of getting information out to Grange members. This is how, as an organization, we are able to stay connected. This is part of how we stay as an informed organization.